The adventures of four Central Park Zoo penguins with commando skills. 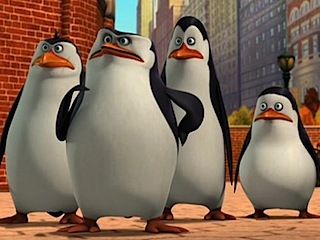 Based on characters introduced in the film Madagascar. 26. 1-26                12 Aug 09   Skorca! 109. 2-61                26 Nov 11   The Big S.T.A.N.K. 137. 3-21                29 Jul 12   P.E.L.T. Text Copyright © 2009-2013, epguides.com. All rights reserved.